I am thankful for the more than 60 authors and illustrators that have contributed their birthday memories and traditions to Happy Birthday Author. I get so excited when an author sends me a birthday memory to share! 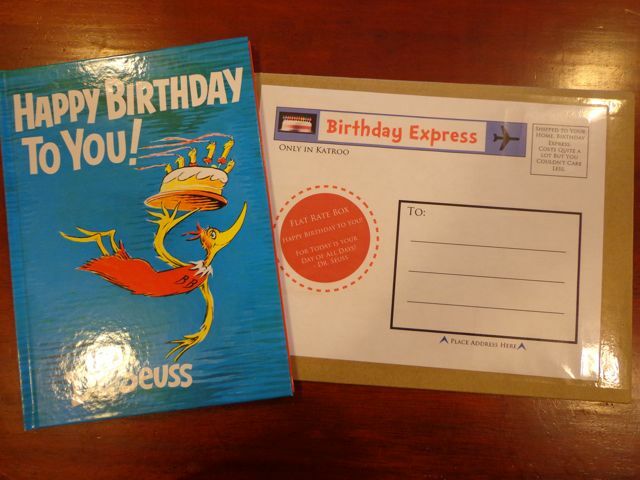 I may never learn of a birthday story or tradition that Dr. Seuss had, but one of his books has inspired a birthday tradition that my wife and I will begin this year with our youngest daughter. I have always wanted to come up with a birthday celebration activity for Happy Birthday To You! by Dr. Seuss. First I thought about simply baking a cake. Then I thought about making a giant Birthday Bird to hang by our bird feeder, without my children's knowledge, for them to see when they wake up in the morning. (I still may act upon this idea!) After thinking about it for the past month (since we started the Dr. Seuss Birthday Countdown) I came up with an idea of a birthday tradition gift for my youngest daughter that I am really excited about. Happy Birthday To You! contains one Dr. Seuss's most recognizable quotes, "Today you are you! That is truer than true! There is no one alive who is you-er than you!" It seems, however, that the story is significantly less recognizable than the quote. This book is set in the land of Katroo where every year on your birthday the Birthday Horn sounds, the Birthday Bird wakes you up, and day full of adventure unfolds. There are wonderful things to stimulate all the senses from birthday luncheons to visits to the Katroo Birthday Pet Reservation where you find the tallest one to have shipped to your home. 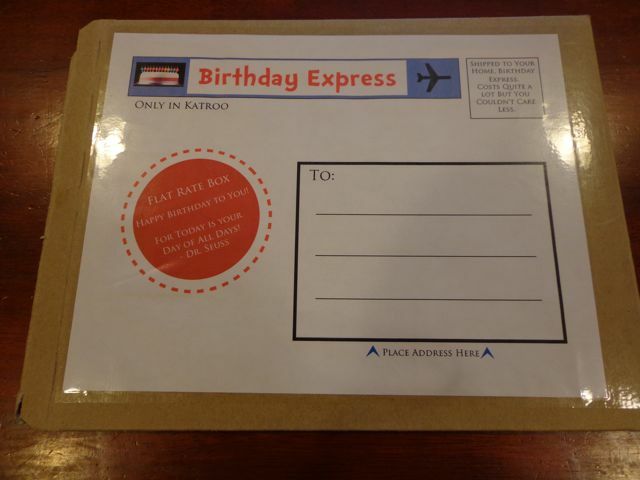 Your birthday in Katroo is an extravaganza to celebrate how special you are. I can't believe she is 1! 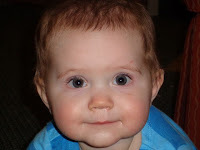 My youngest daughter will be celebrating her first birthday this month. My wife and I saw an opportunity to start a birthday tradition for her with Happy Birthday to You!. Our idea is to give her the book as a gift every year for her birthday in the same special package. The book and package may be the same every year, but each year the book would contain a note from mom and dad telling her how important she is to us. We plan on including memorable stories of events that happened in the past year, reflections on the accomplishments she made, and our thoughts about how there is no one "YOU-er than You!" I used a sturdy cardboard envelope and covered the label with a cold lamination sheet. I also used a little packaging tape. I will write my daughter's name in black permanent marker on the package before giving it to her. I wanted to add an envelope to the inside of the book to hold all of the notes from every year. I added the text below as decoration. I added a baby blue piece of paper behind the words to make it Seussish. The last printable is the note cards that you can print to write a message to your child. 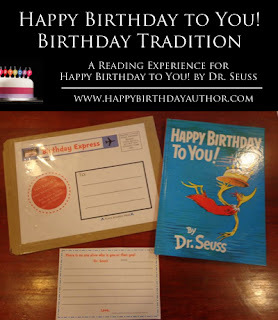 Once your note is written, slip it inside the envelope, and package up your book to begin a birthday tradition. Each year, print out another set of note cards, and write a special note to your little (or big) one to add to the envelope. I can't wait to look back after several years and see all the letters we have written our daughter. Happy Birthday Dr. Seuss! This is one of my favorite days of the year. We will revisiting our favorite books all day today! If you have an Apple device, all the apps for Dr. Suess are on sale, 30%-75% off, this week too! I can't believe how many are available now! I might have to buy a new one. The best deal I found was THE CAT IN THE HAT for 99 cents! Below are links to the iPad apps but Android Apps are on sale at Amazon too! Check out my guest post over at Melissa Northway's blog. 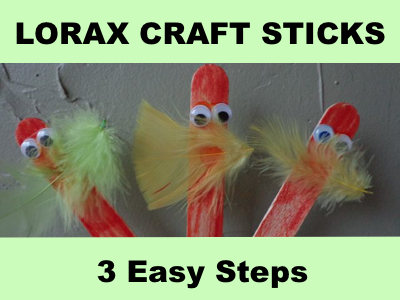 We made Lorax Craft Sticks in 3 easy steps. Click Here to Visit! Need an activity idea for today? I have been busy collecting the best Dr. Seuss Activities. 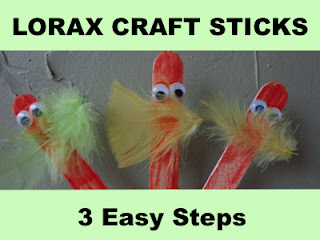 They are all compiled on my Dr. Seuss Book Extension Activities Board on Pinterest. Click Here to visit and follow the board! I have never heard of that book (I love finding new Dr. Seuss books!) 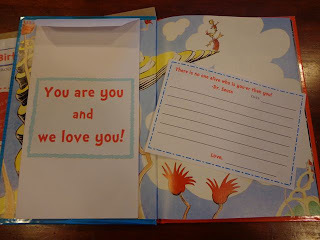 I love the idea of writing a note to your little one each year. What a wonderful collection by the time she is grown! Thanks for sharing it on our link up! Pinning it! Thank you hosting the Dr. Seuss link up! I will never pass up a chance to share our birthday celebrations! How special is this? I LOVE it! You and your wife have very lucky children- and we are lucky to have you sharing all your wonderful ideas with us! 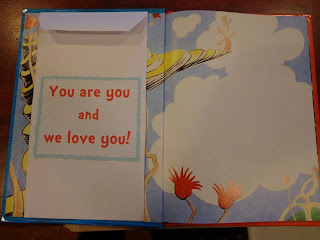 And, of course, we all are lucky to have Dr. Seuss's amazing books to read! Happy Birthdy to my all time, number one favorite author! Thank you so much, Iza! Seeing your comments this morning got the day started right. We had a fun day celebrating Seuss with green eggs and ham for dinner!! Thank you again for sharing this as your free printable of the day! Such a adorable idea. I'm spreading this around. Thank you Joanna! I appreciate the shares on facebook and pinterest! How wonderful that you're sharing this--imagine how many children will grow up knowing how loved they are and imagine how that might change the world! Thank you so much! Will share this and send people to your blog! Wow, Monette! Thank you for your comment. I think you motivated me for at least another 50 birthday celebrations! What a great idea, Eric! I have this book and read it every year on my birthday...it's fun that way! And she will be so happy to have all these great memories...I bet you'll want to write down so many things! Thanks Kathy! We will have lots to write down. So much happens that first year and I have a horrible memory -- so now I won't forget!! Awesome. Thanks for sharing. I think I'm going to start this tradition. Just read the book for the 1st time today. One of my kindergarten students brought it in to share and I absolutely loved it. I hope you start the tradition! I am pretty excited about starting it with my daughter. Cool printables. I like that they match the Suessy style. Love it! Thanks Diana! I appreciate the Pinning Party reminder! Thanks and please pin!! I apprecaite the reminder about the Kidlit blog hop!